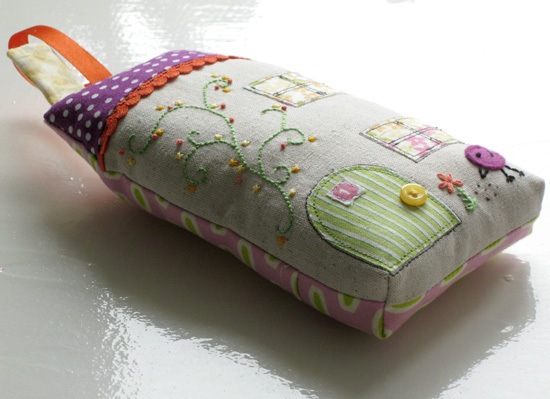 I recently joined in with the fun Pin Cushion Swap over at Sew Far Sew Good and House of Pinheiro. My partner was Rachel from At the Butterfly Ball. 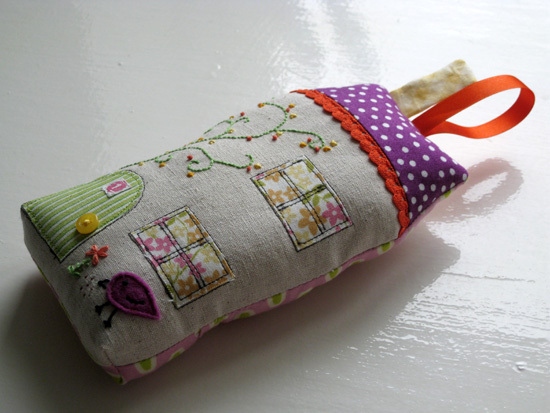 Well, Rachel received her pin cushion from me this week, so I can now do my big Ta-dah and reveal what I made and sent her. With a little storage pouch on the back...with the opening on the bottom rather than the top. Another boo boo on my part (am pretty good at boo boo's!). 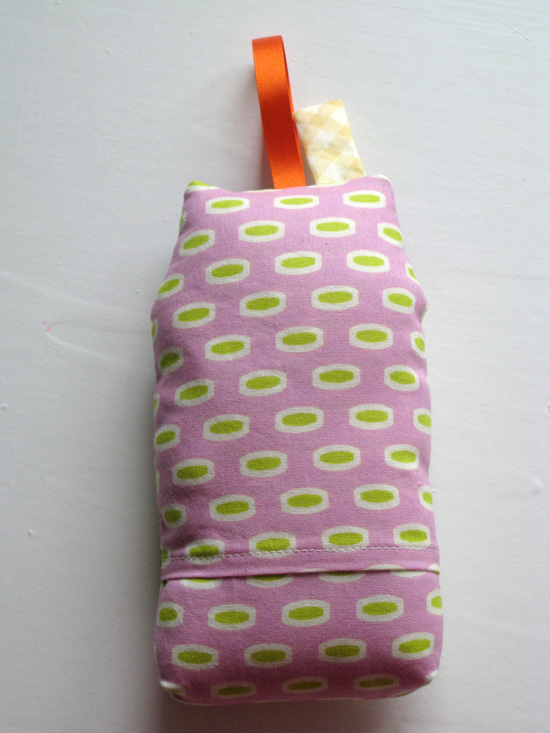 The pouch will work just fine until Rachel tries to hang it up, then anything heavy will come a slip-sliding oooot. Before you go thinking that I am just so smart and clever and talented (ja, like you were thinking that...I have to polish my own halo sometimes...), I used this tutorial as my basis, but stretched the height to something like 19cm, as I wanted some storage element to it...for scissors and marker pens and a little ruler maybe. As a little something extra for Rachel - she has a whole handful of children - I also sent her one of my tea towels. What with summer holidays here, I thought it might be nice as a quiet and not too messy activity for her kid-lettes to colour in and for her to get to use and enjoy her childrens art work. Now...the suspense just kills me! 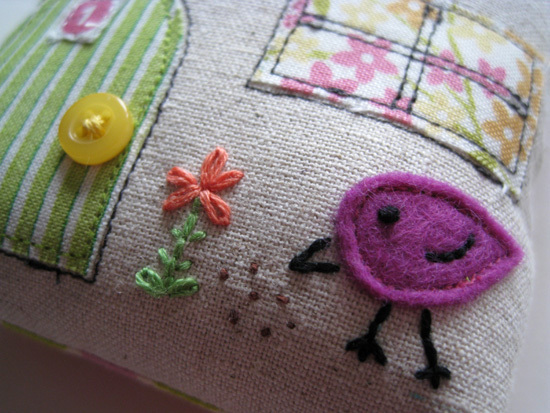 Rachel posted my pin cushion a few days ago. It's going to take forever to get here. Like, a whole week! It is utterly gorgeous! Much too nice to stick pins in - hanging on doorknobs is perfect for this little beauty. It is so beautiful! I love it! Thank you so much! I can't believe how much time and effort you put into everything. It is just perfect! I tried out the pocket in the back and my little scissors fit neatly inside along with my fabric markers. But I currently have it hanging in my crafting room because it was so pretty that it did seem a shame to poke needles and pins into! :-) Thank you again! I can't wait until you get yours, I hope you enjoy it, I had fun making it for you. This is delightful. I always love little houses and seeing the detail that makes them unique. You should be very proud of this, especially the hand stitched honeysuckle. Thanks Kay. Little houses are rather fun, aren't they just. 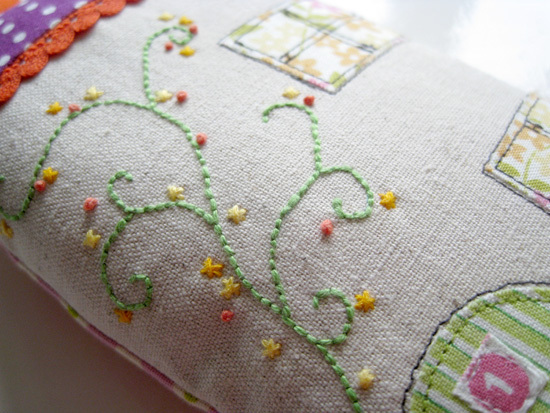 That's a lovely pincushion. I'm glad I'm not the only person who makes booboos when making something!